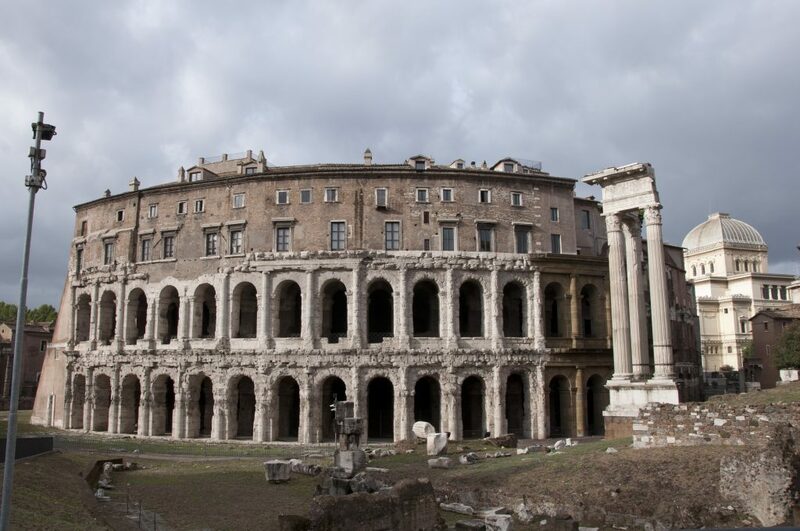 You can walk past the porticus once you pass the Theatre of Marcellus, and in a nice (and rare) touch for Rome, there are some signs with information about the ruins. Across from the portico, make sure to look up at the building. On the wall you’ll se a commemorative plaque in honor of the Jews who were taken by Nazis from here in 1943 and sent to concentration camps, never to return. This one is obvious… sorry. But! It’s also one of the biggest draws of the quarter. 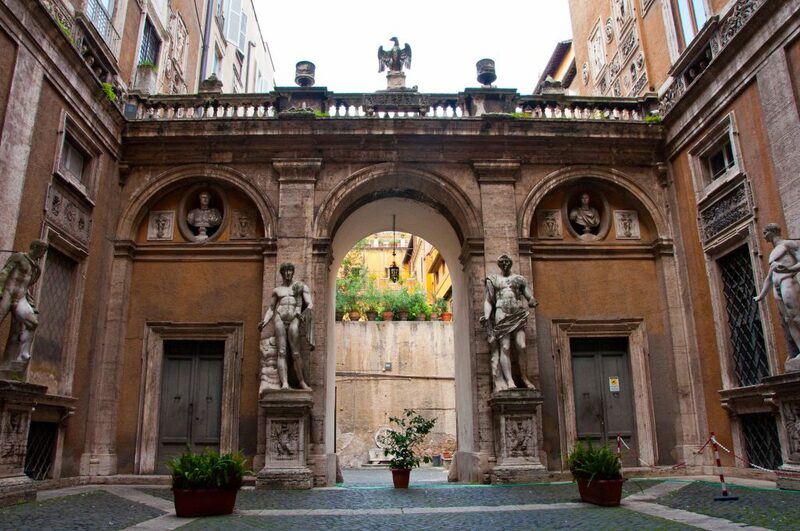 Rome’s Jewish Ghetto has a storied, and tragic, history. 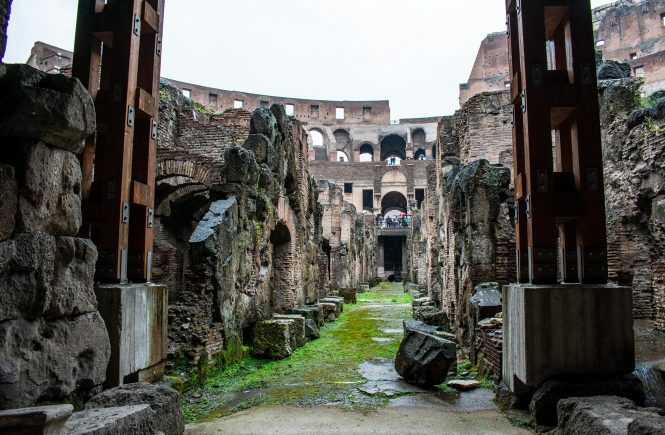 Although Jews have lived in Rome for 2,200 years — making it the longest continuously inhabited Jewish settlement in the world — the Ghetto is newer. It dates back to 1555, when it was walled off by the Pope. (To add insult to injury, Rome’s Jews were made to pay for the wall’s construction). In 1870, with the Unification of Italy, Jews were made citizens for the first time and the wall was demolished. The synagogue was built soon after, making it not only the quarter’s spiritual center but a symbol of hope and equality. 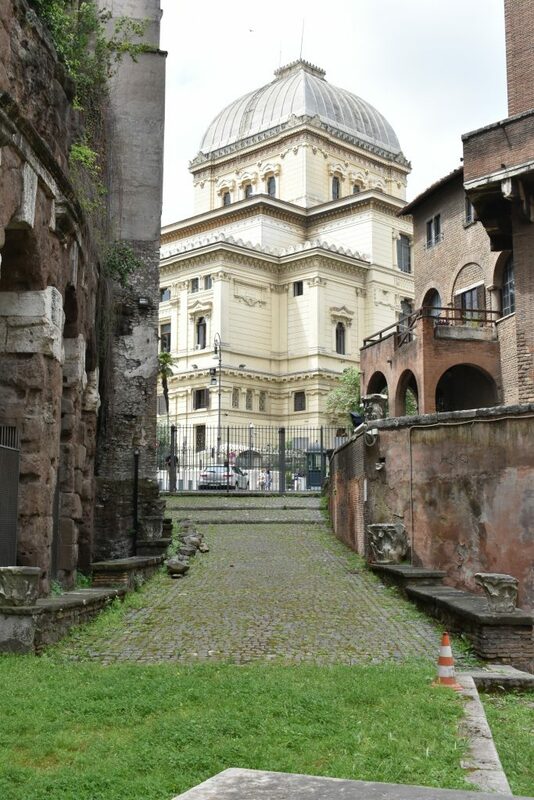 As well as attending services here, you can visit the museum, which has a small exhibition devoted to Rome’s Jewish history. Once, this part of the Ghetto was made up of five different homes, all belonging to the Mattei family. The last one, built in the early 1600s, was Palazzo Mattei. Designed by none other than Carlo Maderno, it’s a Baroque layer cake of bas-reliefs, ancient statues, arches and stunning staircases. 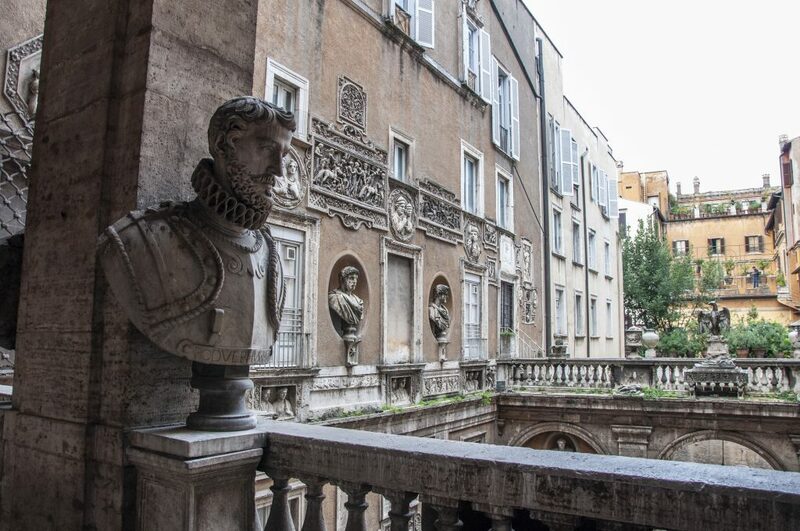 As well as the Matteis — a powerful patrician family — the painter Caravaggio lived here in 1601 (one of the Matteis was his patron at the time). The best part about it? You can walk in to the courtyards to get a glimpse. (You can even sneak inside, if you promise to behave). That’s because a variety of cultural institutions are now based here. One is the Italian Centre for American Studies, which has a library of about 50,000 books. (Pro tip: For 50 euros a year, you can join the library. This means being able to take out books in English as well as being allowed to work in the stunning rooms, still with 17th-century frescoes. 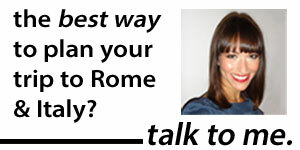 Seriously one of my highlights of living in Rome!). I’ve saved the best for last. This isn’t a “sight”, as such. There is little to no historical information about it. 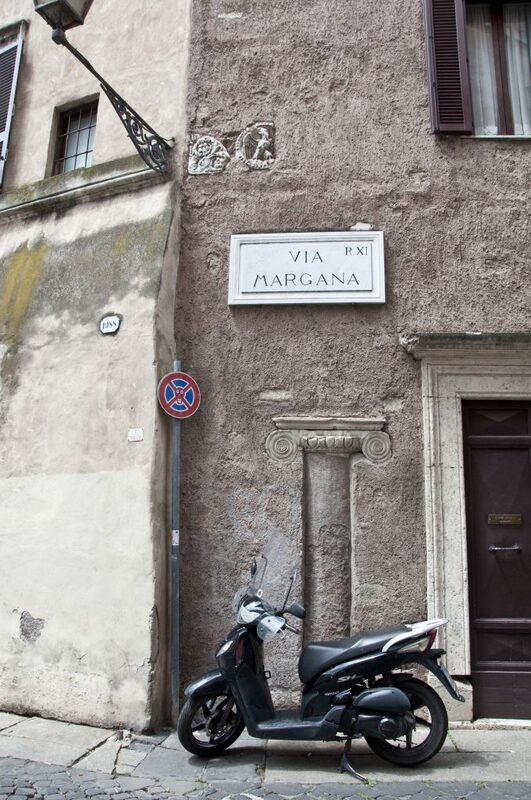 But I just love this corner of Rome. It’s just a semi-pedestrian piazza with some pastel palazzos overlooking it… you know, basic Rome. But! Look closely at this corner. Do you see that? It’s an ancient column sunk into a wall. And more little ancient bits above it. With a door next to it surrounded by an ancient Roman frieze. And that motorino is always outside. For proof, check out my photo of the same spot from 2012. 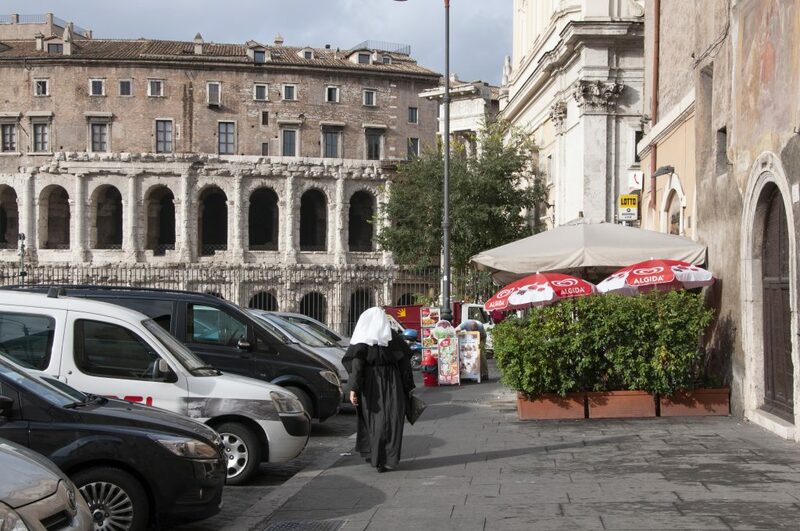 Ugh, I just love that little piece of Rome so much. Serene… pretty… with bits of ancient history… what more could you want? 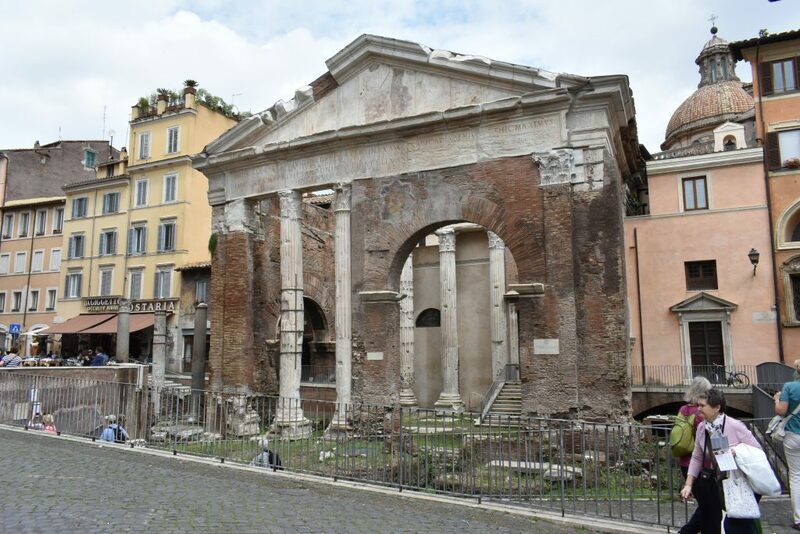 Also: Don’t miss my first post on visiting the Jewish Ghetto, plus visiting Rome’s ancient pyramid and where to find the city’s best gelato.